So unless you’ve been living under a rock in case you missed it, last weekend we hit the road with our girls and traveled to Atlanta for The Curvy Fashionista’s TCF Style Expo. 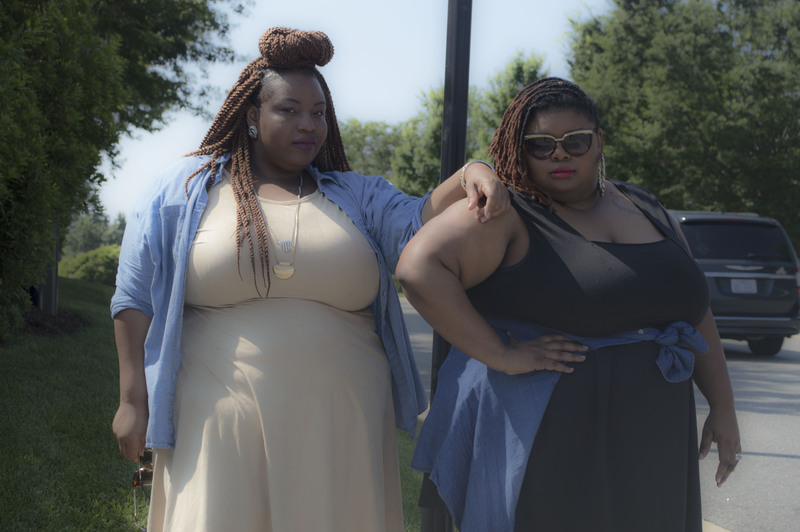 This is an annual style expo, hosted by Marie Denee of The Curvy Fashionista and if you know anything about summertime in the A or the TCF Style Expo, it goes ALL the way down – and this year was no different! The crew hit the road early on Thursday morning, excited and ready for what the weekend held. There were a few of us who were returning and a couple of newbies in the group. The beauty of the expo is once you hit the door, it didn’t even matter if this was your 1st or 50th time… when you walked in, you were bound to see somebody you knew, followed on social media, or would connect with before the end of the weekend… Oh yeah – it’s THAT kind of energy! Like I said before – if you had the opportunity to travel with your girls for a summer weekend in Atlanta to go to one of the hottest style events of the South, why would NOT want to go?! Not to mention, the beautiful location of the expo. This year, the expo was moved to a larger venue, Cobb Galleria, which operated from two different sides. One the one side was registration and panels (we’ll get to those later!) and on the other was a large shopping space (We’ll get to that later, too!). The VIP Experience is unmatched at TCF Style Expo. Not only are you welcomed with southern hospitality, get early access to the expo, and all of the events, but you also get the infamous VIP Gift Bag. Okay, so let’s be real – everybody loves swag bags. I mean, people can say they are played out all they want, but nobody is turning down a bag of free stuff, I don’t care who you are! And that’s one thing the TCF crew has on lock – the swag game! I’m not even going to lie… I STILL haven’t used everything from my 2016 swag bag! It’s THAT serious. See what’s in the TCF VIP Gift Bag here. One of my favorite highlights of the expo are the panel conversations that take place and this year was no different! This year’s panels touched on everything from age and size diversity, confidence, leadership, walking in your purpose, big men’s fashion, living your best life and everything else in between! I also enjoyed the “Style IV Life” panel, which is a movement headed by Shaina of Out Of The Corner and Maui of Phat Girl Fresh. They were sharing ways to love and accept who you are and embrace and live your best life. You know I was ALL over that! There was interaction throughout the conversation and we even got the chance to share our personal experiences with some of the struggles that come with being a strong, black woman. In short, these panels were LIT! But the TCF sisterhood is faaaaaaaarrrrr from that! When I tell you that I have met some of the most genuine, dopest, amazing women in the past two years, that’s EXACTLY what I mean! From last year to this year, I have been introduced to beauties from all over the country, some of whom I have friended and communicate with often, but all who are genuine in their connections. If you don’t want to make new friends or meet powerhouses in the Plus industry, then stay away from TCF because it’s going to happen! And now, the moment you’ve been waiting for: PICTURES! Some photos courtesy of TCF Style Expo official photographer, J. Nicole! See you next year, TCF Style Expo!